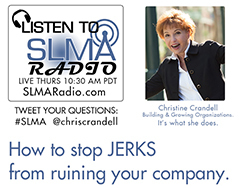 How to Stop Jerks from Ruining Your Company! Christine Crandell is a 25-year B2B expert in market strategy, and building successful, profitable organizations. Her work with CEOs and Boards is focused on helping them understand how to optimize their strategy and align their organizations to accelerate revenue. As President of New Business Strategies, she leads the international strategy consulting firm and has advised more than 100 CEOs and Board of Directors in North America, Europe and Australia in areas including M&A, market category creation, company strategy, and go-to-market planning. She advises CEOs and Boards on how to align messaging, structure and culture with the customer to dramatically improve company performance. Christine holds Board of Advisory roles with several early stage companies. She also lectures at San Francisco State, University of San Francisco and Golden Gate University where she was the recipient of the 2005 Ageno School of Business, Stanley Price Adjunct Professor Award. Christinerude, was named as one the "Top 50 Influential People in Sales and Marketing in 2012", "Top 15 Leaders in Social Selling", "Top 20 Women to Watch in 2012" by the Sales Lead Management Association ("SLMA"), and as one of Silicon Valley's Most Influential Women for 2010 by the Silicon Valley/San Jose Business Journal. An accomplished writer and public speaker, Christine has been published in BusinessWeek, CMO.com, and is a blogger for Forbes.com, CMSwire, and HuffingtonPost. She holds an MBA from Florida Atlantic University and DBA (abd) from Golden Gate University. New Business Strategies is a customer engagement and strategy consulting firm focused on helping B2B and B2B2C companies to become customer-led organizations. Our clients see measurable improvement in their customer retention rates and achieve more predictable revenue by understanding and operationalizing the expectations of their target markets. Becoming a customer-led organization doesn't require black magic, complicated methodologies or huge teams of consultants, it comes down to aligning processes, culture, and technology to outward to what drives value in the eyes of the customer.